September 11th, Taipei, Taiwan – BIOSTAR iMiner A578X8D, an easy to set up all-in-one solution for home and professional miners, is now available on Newegg for US$3499. The BIOSTAR iMiner A578X8D is the world’s first riser card-free and all-in-one crypto mining solution, offering ultra-mining flexibility for different crypto-currencies (Ethereum, Monero, Bitcoin Gold, Zcash, etc.). This plug-and-mine system requires no additional hardware installation, simply power-on to start mining. The BIOSTAR iMiner A578X8D supports Windows 10, Linux and ethOS for different types of miners, and as an exclusive bundle with Newegg, the iMiner A578X8D also comes with an optional ethOS mining operating system to allow users to set up and start mining immediately. 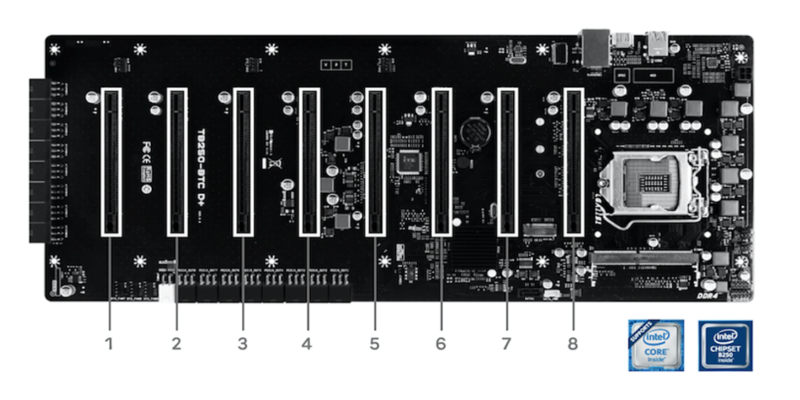 The iMiner A578X8D, all-in-one crypto currency mining system is powered by the BIOSTAR TB250-BTC D+ motherboard that features native 8-GPU design; the eight PCI-express x16 slots no longer require the use of a riser card or cable, which creates better spacing. The riser card-free design also offers instant and long-term cost savings. The eight AMD Radeon RX570 GPUs deliver a highly efficient ETH hashrate of 220 MH/s (±5%) while maintaining lower power consumption. The BIOSTAR Radeon RX570 8G graphics cards feature a unique FPS dual-heatpipe cooler design along with dual cooling fans to provide efficient cooling for 24/7 mining operation. The efficient thermal management of iMiner A578X8D is made possible with the spacious interior due to the BIOSTAR TB250-BTC D+ and precise placement of the seven fans; three 120mm front intake fans and four 120mm exhaust fans at the back of the chassis. This cooling setup provides powerful thermal cooling for the iMiner system for stable 24/7 mining operations. 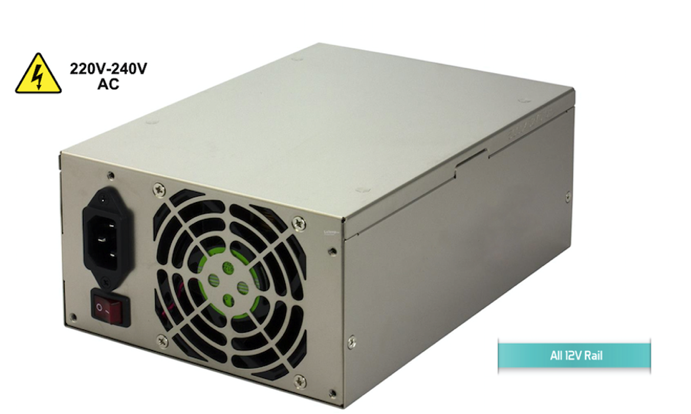 The iMiner A578X8D is powered by a +12v single-rail designed 1600W blockchain computing-grade power supply with 100% solid capacitors and dual-ball bearing fans for quiet and reliable round the clock operation. It offers a Meantime Between Failure (MTBF) of 200,000 hours, meeting even the demanding needs of most professional mining operators. The power supply is easily swappable for maintenance or replacement. Graphics Card Slot Detection BIOS to show different states: Working/Error/None. The software helps to detect GPU state on POST screen, so miners can fix it before entering the OS. Working means that the GPU is operating at normal state. Error means that the data is incomplete. None means that no signal for GPU. 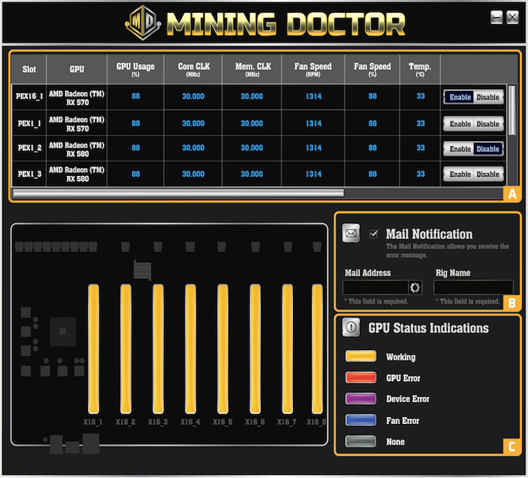 Mining Doctor software checks the current state of each GPU such as usage, core, clock speed, memory clock speed, fan speed, and temperature. In addition, if the iMiner detects an error state, it automatically sends an email notification, making it easier to manage scaled mining farm remotely. Exclusively on Newegg, the iMiner A578X8D will be bundled with the ethOS USB drive, ensuring the simplest and fastest way to set up the new iMiner rig. 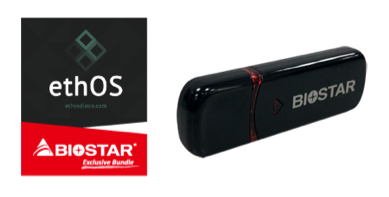 The ethOS is fully compatible with BIOSTAR’s crypto mining products, and comes with an exclusive BIOSTAR theme. More information here. 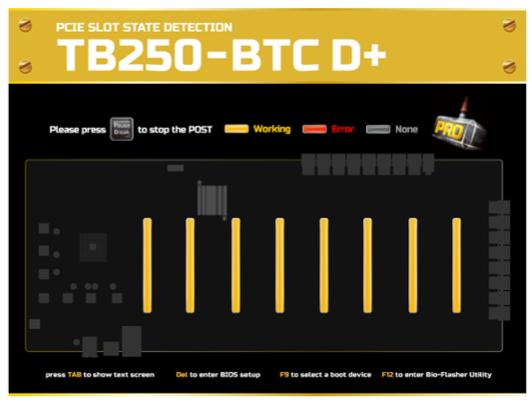 The BIOSTAR iMiner A578X8D is a plug-and-mine crypto currency mining system that requires no additional hardware installation. It offers an easy-to-maintain chassis and layout that allows future upgrades. The riser card-free design gives instant savings and a space-saving layout that contributes to the compact mining system. 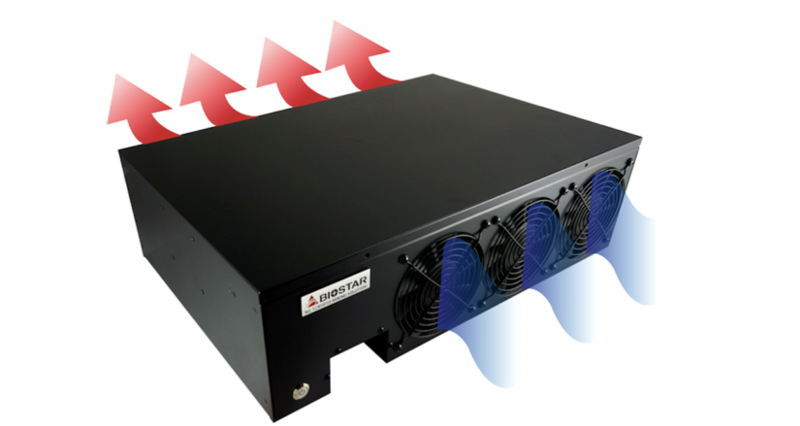 Its powerful and efficient thermal flow management offers stable 24/7 mining operations. BIOSTAR, is a brand dedicated to the production of motherboards, graphics cards, industrial computing systems, IoT, crypto mining equipment, and healthcare solutions. Since its establishment in 1986, the BIOSTAR GROUP has become a major motherboard supplier in the IT industry as well as in IoT, Internet of Things. In order to pursue the best quality and aesthetic design, BIOSTAR has invested heavily in ID design, equipment, global market research as well as R&D. With a constant emphasis on quality, BIOSTAR always seeks to beyond better and race to the future.